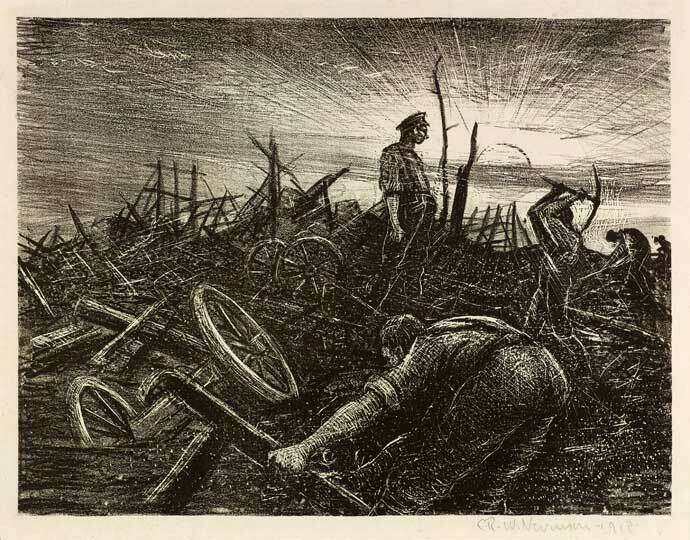 It makes perfect sense that Nevinson’s First World War prints should be the ones in the window of Osborne Samuel’s show, and not simply because of the centenary. They have always commanded attention, stamping the ragged daily patterns of a terrible conflict onto paper, and subsequently into people’s minds. Returning to the Trenches (1916) churns up the page, lines punching upwards and falling away like pistons, so that you rush through the composition in one sweep before noticing the human faces in its midst. Column on the March (1916) channels more men relentlessly towards a bleak vanishing point. These and the dizzying images of biplanes banking and plunging through spot-lit clouds (also in pride of place on Bruton Street) are Nevinson’s most famous works, in which his early Futurist experiments were hammered into shape by mechanised warfare. Popularly they define him; he is one of our great War Artists. The ‘problem’ with Nevinson – at least in terms of art-historical taste – is that he didn’t follow this wartime path particularly far. During the conflict, his sudden reversion to naturalistic art (thoughtfully addressed in the Imperial War Museum’s ‘Truth and Memory’ exhibition) confused many of his patrons and still sits oddly with people today. Whereas Paul Nash or Stanley Spencer (Nevinson’s pre-war contemporaries at the Slade) seemed to find their artistic direction during the First World War, and went on to pursue their distinctive brands of British modernism for years to come, Nevinson’s style scattered. The remainder of Osborne Samuel’s impressively comprehensive exhibition provides a fascinating insight into where he went next. He roved, is the simple answer: to Paris, New York and London, and all over the place stylistically. I don’t mean that pejoratively. Nevinson’s evident facility as a printmaker allowed him to pick and choose his style to suit his subject (or perhaps his mood), and although such a diverse approach frustrates traditional artistic narratives of progress or ‘vision’, it makes for some great surprises in a show this size. 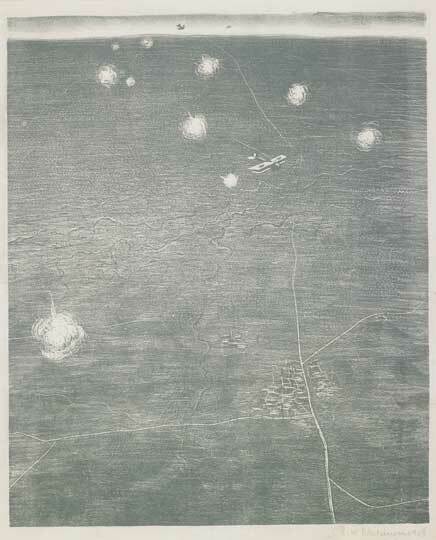 The hazy, nebulous lithograph Over the Lines (1918) completely subverts the clamour of his other aircraft prints with its high, hovering perspective. His celebrated drypoint Looking through Brooklyn Bridge (1921), whose sharp suspension cables cut a composition into the hazy cityscape beyond, is shown alongside a less well-known but equally dramatic mezzotint of towering New York skyscrapers at night, backlit by sheets of smudgy city light. A late etching of Manette Street in London (1926–7) looks very like a Sickert (they held a joint exhibition in Chicago in January 1926); a shimmering drypoint and acquatint of Waterloo Bridge (1924–6) pays clear homage to Whistler. It’s difficult to pull out key threads from this tapestry of styles and subjects. At a push, I’d go for three: his enduring interest in crowds, with their lively confusion of patterns and personalities; his recognition that modern architecture could create modernist compositions all by itself; and his frequent use of light and atmosphere as powerful structural tools, as vital and various as the buildings and landscapes themselves. David Boyd Haycock argues in this month’s Apollo that modern British watercolours deserve greater recognition. The same argument can be made for modern British prints. A few of Nevinson’s wartime paintings hang in the downstairs gallery, but they pale in comparison to the literal incisiveness of some of his works on paper. 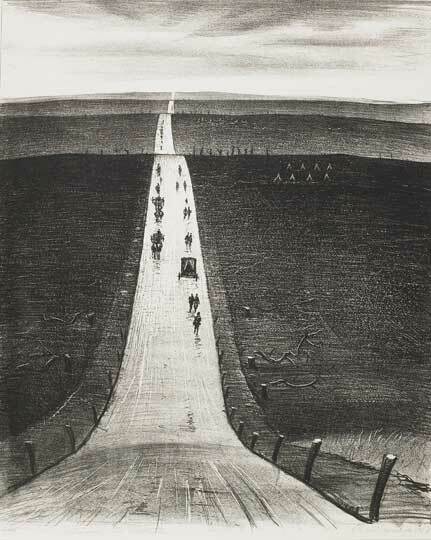 No exhibition of Nevinson’s prints could achieve the cogency of Paul Nash’s watercolours – which are on display not far away, in Boyd Haycock’s curated exhibition at Piano Nobile – and nobody will like all of them, but they deserve attention. Of the lot, the one that sticks with me is A Flooded Trench on the Yser (1916) a devastatingly austere drypoint impression of the trenches, scored by thin lines of biting rain. The exhibition is on for a couple more days, and while there’s clearly plenty else to see in London this week, I recommend getting to it before it closes, and picking out a few favourites of your own. 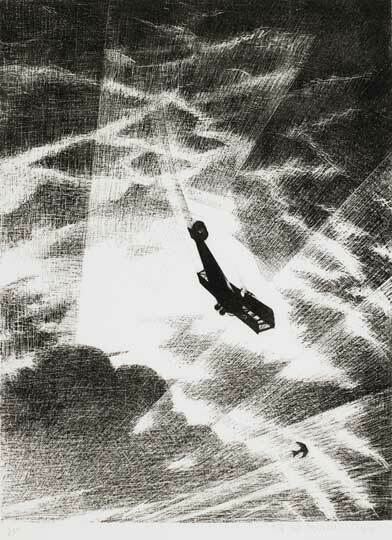 ‘CRW Nevinson: A Printmaker in War and Peace’ is at Osborne Samuel, London, until 18 October.